How do you successfully build networks and ecosystems as your company moves beyond single solutions and one-to-one collaborations? And how do you tap into the digital capabilities of partners required to expand your market reach and delivery? Open innovation in today’s world has become more complex. Advances in information technology and connectivity have heightened consumers’ expectations for seamless experiences from choosing to buying to rapid and/or instant delivery – including service, repair, and even return of purchases. Blockchain is enabling unprecedented levels of trust and transparency in data-sharing, with transformative impact. Finally, price wars and the need for speed have put intense pressure on cost control and efficiency. Collaboration has never been more necessary. Choosing and skillfully managing the right partnerships has never been more critical. 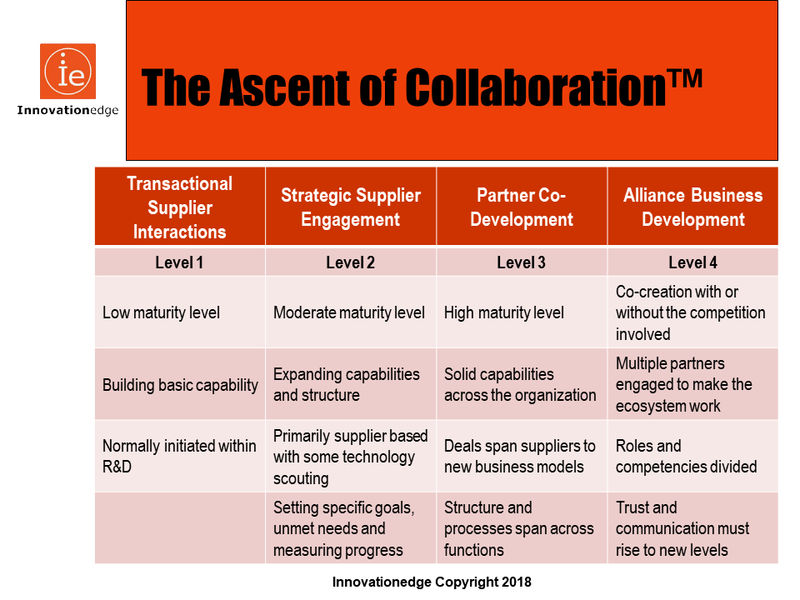 Some of the most successful strategic partnerships we have seen are at the top rung of what we call the Ascent of Collaboration (see figure below), Innovationedge’s (IE) four-level maturity model. Level 4, Alliance Business Development, involves multiple partners and ecosystems (which may include competitors) and requires the highest degree of communication and trust. Kroger, which is building its ecosystem on numerous fronts to create the full convenience and digital experience. Partnerships (see IE blog) include several to expand digital capabilities (online ordering, home delivery, driverless delivery), and convenience (meal kits as well as a groundbreaking competitive/collaborative partnership with Walgreens). Nestle has a diversified portfolio approach with multiple partnerships in multiple arenas including its distribution-expanding alliance with Starbucks (Global Coffee Alliance), its socially responsible Creating Shared Value program, its participation with Kroger, Unilever, Walmart, Tyson Foods, McCormick & Co., Dole Food Co., Driscoll’s and other global food companies with IBM in a consortium to leverage blockchain technology for safety, traceability and transparency across the food supply web. Honda for centuries did everything itself, but like other car makers around the world is under stress from the huge investments needed to develop new technologies used in electric vehicles and autonomous driving. Honda has now announced deals with Chinese search giant Baidu Inc. to develop mapping technology for autonomous vehicles, and with Chinese startup SenseTime Co. to build camera software for self-driving vehicles. The company has a deal with SoftBank Corp. for artificial intelligence that SoftBank says will be able to read a driver’s emotions. Honda is even farming out the development of an electric motor. Hitachi Ltd.’s auto-parts division has the majority stake in a joint venture with Honda that will make electric motors for Honda cars by March 2021. IBM and Samsung jointly developed Autonomous Decentralized Peer-to-Peer Telemetry (ADEPT), a proof of concept protocol that allows appliances such as washing machines, televisions, and refrigerators to purchase their own supplies such as detergent, negotiate with each other for energy use, and order their own maintenance. ADEPT leverages self-executing smart contracts based on blockchain technology to provide a secure, low-cost way for these devices to interact. People are already outsourcing their interactions with customer service representatives to bots, such as startup Trim’s bot that chats with cable television provider Comcast to negotiate prices. Not only are companies forming ecosystems, their products are forming relationships! Amazon is perhaps the most powerful, extensive, and sophisticated ecosystem (or set of multiple ecosystems) that exists today. Between its marketplace with third-party retail sellers, its AWS Partner Network for cloud services, and its acquisitions of small startups like Pillpack and Ring to its industry-changing Whole Foods acquisition, Amazon both leads the way and dominates with its omnipresence in the full end-to-end retail experience. Amazon is by no means stopping where it is today either – B2B is one of its next frontiers. All these alliances and ecosystems leverage the core strengths of each player while collectively creating powerful market advantage. Today’s collaborations are not just filling technical gaps or adding new customers – they are reinventing value chains and changing the game.